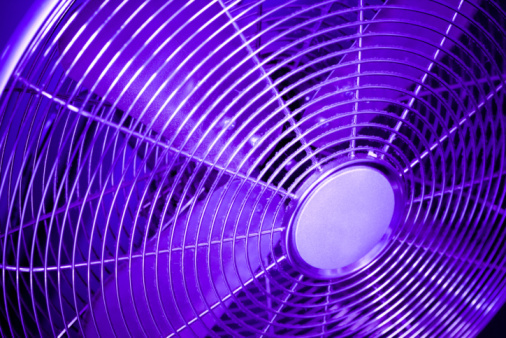 Fans can naturally ventilate a room, cooling the room temperature while conserving energy. They provide a less-expensive option to cooling a room than running central air conditioning. Fan ventilation is especially effective in rooms that have windows or outside doors positioned on opposite walls. This can create a wind tunnel effect that circulates air through one window and out the other for cooling and ventilation. Electric fans ventilate a room. Open the windows to create ventilation. Open the window in the room that you want to ventilate. If the room has windows or doors positioned on opposite walls, open those windows as well. Determine which window allows the wind to blow into your room. You can use the wind to enhance natural ventilation, along with your fans. Place an electric fan in front of the window where the breeze enters, pointing into the room. 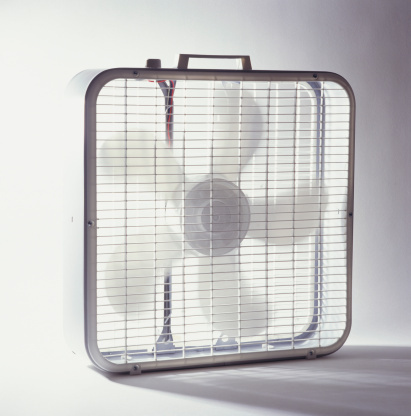 You can use a standard tall fan on a stand or place a box fan on a table in front of the window. As an alternative, consider purchasing a window exhaust fan that fits directly inside your window sill. Place a second fan pointing out of the window or door on the other side of the room. While it seems counter-intuitive to blow air out of the room, this will create a circulation through one window and out the other. You can also use a window exhaust fan to achieve this. Turn on the fans to ventilate your room. The wind will blow into one window, through the fan into the room, then through the second fan and out the window, creating a continuous motion that will cool the room.